I just launched the 2010 Cycle Chic Calendar over at Cycle Chic [see the cover below] and that's all well and good. Nice photography from Copenhagen featuring elegance and bicycles. All well and good. It'll be popular as it always is. The 2010 Copenhagenize Bicycle Infrastructure Fetish Calendar! Probably the kinkiest calendar for 2010 on the market if you're a traffic planner, bicycle advocate or urban planner with a untameable fetish for bicycle infrastructure. 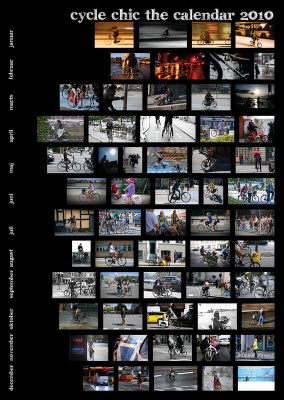 Copenhagenize.com offers up its hottest photos to keep you satisfied throughout the year wherever you are. Each month of the year you'll be caressed by steaming hot photos of cycle tracks, bike-to-train facilities, bike parking prototypes, you name it. You can't swing a blow-up doll around without hitting the infrastructure or bike facilities. Buy it if you dare. Ask for plain, brown wrapping paper. Give it as a gift to your favourite, infrastructurally-frustrated traffic planner. Hang it up by the coffee machine in DoTs around the world. Spread the word. Spread the love. Check out the preview over at Lulu.com quicksmart. Buy now. Operators are standing by. Se habla espanol. If you're odd, then you can always just go for the 'girls on bikes' thang.